CONTAINS: Almonds and Milk-Derived Ingredients. CONTAINS: Almonds, Walnuts and Milk-Derived Ingredients. Protein Blend (Milk Protein Isolate, Whey Protein Isolate), soluble corn fiber, erythritol, water, palm kernel oil, almonds, natural flavors, sodium caseinate. Contains less than 2% of the following: sea salt, gum arabic, spirulina extract (color), red cabbage extract (color), tumeric extract (color), radish extract (color), sucralose, sunflower lecithin. Contains: Milk, Almonds. Processed in a facility that also processes egg, peanuts, soy, wheat, and other tree nuts. Protein Blend (Milk Protein Isolate, Whey Protein Isolate), Soluble Corn Fiber, Almonds, Water, Cocoa Butter, Erythritol, Natural Flavors, Dried Blueberries, Contains less than 2% of the following: Sea Salt, Cinnamon, Baking Soda, Sodium Caseinate, Cellulose Gum, Xanthan Gum, Steviol Glycosides (Stevia), Sucralose, Sunflower Lecithin. Protein Blend (Milk Protein Isolate, Whey Protein Isolate), Soluble Corn Fiber (Prebiotic Fiber), Almonds, Cocoa (Processed with Alkali), Water, Natural Flavors, Palm Oil, Sea Salt, Calcium Carbonate, Sucralose, Steviol Glycosides (Stevia). Protein Blend (Milk Protein Isolate, Whey Protein Isolate), Soluble Corn Fiber, Almonds, Water, Unsweetened Chocolate, Erythritol, Natural Flavors, Cocoa Butter, Contains less than 2% of the following: Sea Salt, Sunflower Lecithin, Steviol Glycosides (Stevia), Sucralose. Contains milk, almonds, hazelnuts. Processed in a facility that also processes eggs, peanuts, soy, wheat, and other tree nuts. Protein Blend (Milk Protein Isolate, Whey Protein Isolate), Peanuts, Soluble Corn Fiber, Water, Erythritol, Unsweetened Chocolate, Natural Flavors, Cocoa Butter, Contains less than 2% of the following: Sodium Caseinate, Sea Salt, Steviol Glycosides (Stevia), Sunflower Lecithin. Protein Blend (Milk Protein Isolate, Whey Protein Isolate), Soluble Corn Fiber, Almonds, Water, Erythritol, Natural Flavors, Contains less than 2% of the following: Sea Salt, Cinnamon, Steviol Glycosides (Stevia). Protein Blend (Milk Protein Isolate, Whey Protein Isolate), Soluble Corn Fiber, Almonds, Water, Erythritol, Dried Coconut, Natural Flavors, Contains less than 2% of the following: Cashews, Sea Salt, Steviol Glycosides (Stevia). Protein Blend (Milk Protein Isolate, Whey Protein Isolate), Soluble Corn Fiber, Almonds, Water, Cocoa Butter, Natural Flavors, Erythritol, Cocoa Processed with Alkali, Contains less than 2% of the following: Coconut Oil, Sea Salt, Sodium Caseinate, Sunflower Lecithin, Baking Soda, Steviol Glycosides (Stevia), Xanthan Gum, Sucralose. Protein Blend (Milk Protein Isolate, Whey Protein Isolate), Soluble Corn Fiber, Almonds, Water, Erythritol, Unsweetened Chocolate, Cocoa Processed With Alkali, Natural Flavors, Cocoa Butter, Contains less than 2% of the following: Sea Salt, Sunflower Lecithin, Steviol Glycosides (Stevia). Protein Blend (Milk Protein Isolate, Whey Protein Isolate), Soluble Corn Fiber (Prebiotic Fiber), Almonds, Erythritol, Water, Natural Flavors, Palm Oil, Sea Salt, Citric Acid, Steviol Glycosides (stevia). Protein Blend( Milk protein isolate, Whey protein isolate), Soluble corn fiber, Water, Almonds, Erythritol, Natural Flavors, Palm Kernel Oil, Contains less than 2% of the following: Butter (cream, salt), Salt, Baking soda, Sodium caseinate, Xanthan gum, Steviol Glycosides(Stevia), Sunflower Lecithin, Honey+.+Adds Trivial amounts of sugars. CONTAINS: Milk, Almonds. Processed in a facility that also processes eggs, peanuts, soy, wheat and other tree nuts. Protein Blend( Milk protein isolate, Whey protein isolate), Soluble corn fiber, Water, Almonds, Erythritol, Natural Flavors, Palm Kernel Oil, Contains less than 2% of the following: Butter (cream,salt), Salt, Baking soda, Sodium caseinate, Xanthan gum, Steviol Glycosides(Stevia), Sunflower Lecithin, Honey+.+Adds Trivial amounts of sugars. Protein Blend (Milk Protein Isolate, Whey Protein Isolate), Soluble Corn Fiber, Water, Almonds, Cocoa Butter, Cocoa Processed with Alkali, Natural Flavors, Erythritol, Contains less than 2% of the following: Coconut Oil, Sea Salt, Baking Soda, Sodium Caseinate, Peppermint Oil, Spirulina Extract (Color), Beta Carotene (Color), Xanthan Gum, Steviol Glycosides (Stevia), Sucralose, Sunflower Lecithin. Protein Blend (Milk Protein Isolate, Whey Protein Isolate), Soluble Corn Fiber (Prebiotic Fiber), Almonds, Water, Natural Flavors, Erythritol, Palm Oil, Dried Blueberries, Dried Strawberries, Sea Salt, Calcium Carbonate, Sucralose, Malic Acid, Citric Acid, Steviol Glycosides (Stevia). Protein Blend (Milk Protein Isolate, Whey Protein Isolate), Soluble Corn Fiber, Almonds, Water, Erythritol, Natural Flavors, Unsweetened Chocolate, Cocoa Butter, Contains less than 2% of the following: Cocoa Processed With Alkali, Coconut Oil, Sea Salt, Baking Soda, Steviol Glycosides (Stevia), Xanthan Gum, Sunflower Lecithin. Protein Blend (Milk Protein Isolate, Whey Protein Isolate), Soluble Corn Fiber, Almonds, Water, Oats**, Unsweetened Chocolate, Natural Flavors, Erythritol, Contains less than 2% of the following: Cocoa Butter, Sea Salt, Cinnamon, Sunflower Lecithin, Steviol Glycosides (Stevia), Sucralose. CONTAINS: Peanuts, Almonds and Milk-Derived Ingredients. Protein Blend (Milk Protein Isolate, Whey Protein Isolate), Soluble Corn Fiber (Prebiotic Fiber), Peanuts, Almonds, Water, Natural Flavors, Erythritol, Palm Oil, Sea Salt, Calcium Carbonate, Sucralose, Steviol Glycosides (Stevia). Protein Blend(Milk Protein Isolate, Whey Protein Isolate), Soluble Corn Fiber, Peanuts, Water, Erythritol, Almonds, Peanut Flour, Natural Flavors, Cocoa(Processed with Alkali). Contains Less Than 2% Of The Following: Unsweetened Chocolate, Cocoa Butter, Sea Salt, Sodium Caseinate, Monk Fruit Extract, Steviol Glycosides(Stevia), Sunflower Lecithin. Contains : Almonds, Peanuts & Milk. Processed In A Facility That Also Processes Eggs, Soy, Wheat, And Other Tree Nuts. Protein Blend(Milk Protein Isolate, Whey Protein Isolate),Soluble Corn Fiber, Peanuts, Water, Erythritol, Almonds, Peanut Flour, Natural Flavors, Cocoa(Processed with Alkali). Contains Less Than 2% Of The Following: Unsweetened Chocolate, Cocoa Butter, Sea Salt, Sodium Caseinate, Monk Fruit Extract, Steviol Glycosides(Stevia), Sunflower Lecithin. Protein Blend (Milk Protein Isolate, Whey Protein Isolate), Soluble Corn Fiber, Peanuts, Water, Almonds, Natural Flavors, Erythritol, Contains less than 2% of the following: Sea Salt, Sucralose, Steviol Glycosides (Stevia). Protein blend (milk protein isolate, whey protein isolate), soluble corn fiber, water, almonds, erythritol, palm kernel oil, natural flavors, sodium caseinte, contains less than 2% of the following: cocoa processed with alkali, sea salt, red edible glitter [gum arabic, radish juice concentrate (color), citric acid], sunflower and/or soy lecithin, steviol glycosides (stevia). Contains milk, soy, almonds. Processed in a facility that also processes eggs, peanuts, wheat, and other tree nuts. * Isomalto-Oligosaccharides Are Prebiotic Fibers Derived From Plant Sources. Contains Almonds And Milk Derived Ingredients. Protein Blend (Milk Protein Isolate, Whey Protein Isolate), Soluble Corn Fiber, Almonds, Erythritol, Water, Unsweetened Chocolate, Natural Flavors, Cocoa Butter. Contains less than 2% of the following: Cinnamon, Sea Salt, Baking Soda, Palm Oil, Steviol Glycosides (Stevia), Sunflower Lecithin, Sucralose, Cellulose Gum, Xanthan Gum. Contains Almonds, Pecans And Milk-Derived Ingredients. Protein Blend (Whey Protein Isolate, Milk Protein Isolate), Isomalto-Oligosaccharides* (Prebiotic Fiber), Almonds, Water, Erythritol, Freeze Dried Strawberries. Contains less than 2% of the following: Sea Salt, Stevia, Lo Han Guo, Natural Flavors. Contains Almonds and Milk Derived Ingredients. Protein Blend (Whey Protein Isolate, Milk Protein Isolate), Isomalto-Oligosaccharides* (100% Natural Prebiotic Fiber), Peanut Butter, Water, Peanuts, Natural Flavors, Sea Salt, Lo Han Guo, Sucralose. Protein Blend (Whey Protein Isolate, Milk Protein Isolate), Isomalto-Oligosaccharides* (100% Natural Prebiotic Fiber), Almonds, Water, Natural Flavors, Sea Salt, Lo Han Guo, Sucralose. Contains Almonds And Milk-Derived Ingredients. Protein Blend (Milk Protein Isolate, Whey Protein Isolate), Soluble Corn Fiber (Prebiotic Fiber), Palm Oil, Almonds, Water, Erythritol, Pecans, Natural Flavors, Pumpkin Powder, Sea Salt, Butter, Sunflower Lecithin, Baking Soda, Sucralose, Annatto Extract (Color), Xanthan Gum, Cinnamon, Steviol Glycosides (Stevia). Protein Blend (Milk Protein Isolate, Whey Protein Isolate), Soluble Corn Fiber, Almonds, Water, Cocoa Butter, Natural Flavors, Cocoa Processed with Alkali, Erythritol, Contains less than 2% of the following: Sodium Caseinate, Sea Salt, Steviol Glycosides (Stevia), Sucralose, Sunflower Lecithin. Protein Blend (Milk Protein Isolate, Whey Protein Isolate), Soluble Corn Fiber, Almonds, Water, Erythritol, Unsweetened Chocolate, Natural Flavors, Cocoa Butter, Contains less than 2% of the following: Sea Salt, Cinnamon, Sunflower Lecithin, Baking Soda, Steviol Glycosides (Stevia), Cellulose Gum, Xanthan Gum, Sucralose. Protein Blend (Milk Protein Isolate, Whey Protein Isolate), Soluble Corn Fiber, Almonds, Water, Erythritol, Natural Flavors, Dried Strawberries, Contains less than 2% of the following: Sea Salt, Steviol Glycosides (Stevia). Protein Blend (Milk Protein Isolate, Whey Protein Isolate), Soluble Corn Fiber (Prebiotic Fiber), Almonds, Water, Natural Flavors, Erythritol, Palm Oil, Sea Salt, Sucralose. Protein Blend (Milk Protein Isolate, Whey Protein Isolate), Soluble Corn Fiber, Almonds, Water, Cocoa Butter, Raspberries, Natural Flavors, Erythritol, Contains less than 2% of the following: Sodium Caseinate, Sea Salt, Sunflower Lecithin, Steviol Glycosides (Stevia), Sucralose. Protein Blend (Milk Protein Isolate, Whey Protein Isolate), Soluble Corn Fiber, Almonds, Water, Dried Apples, Natural Flavors, Erythritol, Contains less than 2% of the following: Sea Salt, Cinnamon, Sucralose. Protein Blend (Milk Protein Isolate, Whey Protein Isolate), Soluble Corn Fiber, Erythritol, Water, Palm Kernel Oil, Almonds, Natural Flavors, Sodium Caseinate, Contains less than 2% of the following: Sea Salt, Gum Arabic, Spirulina Extract (Color), Red Cabbage Extract (Color), Turmeric Extract (Color), Radish Extract (Color), Sucralose, Sunflower Lecithin. Protein Blend (Milk Protein Isolate, Whey Protein Isolate), Soluble Corn Fiber, Almonds, Water, Cocoa Processed With Alkali, Natural Flavors, Erythritol, Contains less than 2% of the following: Sea Salt, Steviol Glycosides (Stevia), Sucralose. Protein blend (milk protein isolate, whey protein isolate), soluble corn fiber, almonds, water, erythritol, palm kernel oil, natural flavors, sodium caseinate, Contains less than 2% of the following: Cocoa processed with alkali, sea salt, beet root powder (color), cabbage vegetable juice (color), beta carotene (color), annatto extract (color), carnuba wax, gum arabic, sunflower lecithin, steviol glycosides (stevia). Contains almonds. Processed in a facility that also processes eggs, peanuts, soy, wheat, and other tree nuts. Protein Blend (Milk Protein Isolate, Whey Protein Isolate), Soluble Corn Fiber, Water, Almonds, Erythritol, Natural Flavors, Palm Kernel Oil, Contains less than 2% of the following: Butter (Cream, Salt), Baking Soda, Sodium Caseinate, Xanthan Gum, Steviol Glycosides (Stevia), Sunflower Lecithin, Honey†. †Adds trivial amount of sugars. Protein Blend (Milk Protein Isolate, Whey Protein Isolate), Soluble Corn Fiber, Water, Natural Flavors, Erythritol, Contains less than 2% of the following: Sea Salt, Sucralose. Sep 18, 2018 “IMO Fiber” No More! FDA DENIES Isomaltooligosaccharide Fiber Status! It's official: Isomaltooligosaccharide is NOT a fiber, per the FDA's latest guidance that approved eight new fibers... but DENIED IMO. It's over, IMO. Quest recently announced they are switching to soluble corn fiber from IMOs in their famous protein bar to improve taste, texture, and shelf life. Quest Nutrition's product line attempts to solve the age-old problem of protein bars: How do you make a protein bar that tastes good, is sugar-free, low-carb, and has an acceptable shelf life? The answer is a protein blend consisting only of whey and milk protein isolate (refined to have no fat and nearly no carbs) combined with a prebiotic fiber blend, 100% natural flavors, and sweetened with a combination of either lo han guo and sucralose, or stevia and erythritol. Quest's open label policy, and commitment to natural ingredients, is what initially caught our eye. Unlike many other protein bars on the market, it's easy to identify exactly what you're putting into your body. Each bar contains 20g of protein and the bulk of your necessary dietary fiber. 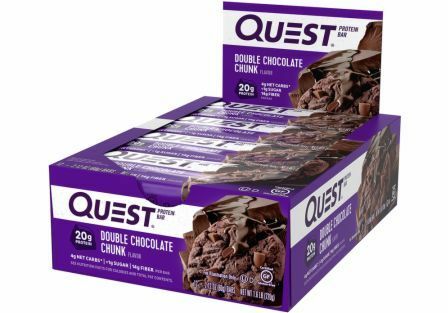 Depending on flavor, Quest Nutrition protein bars run from about 160 to 210 calories. Mainly, we're interested in the sweeteners used to make Quest protein bars, as well as a particularly difficult-to-pronounce fiber additive. The sweeteners used in Quest bars may be unfamiliar, but at this point, most people are least passingly familiar with stevia — the sweet leaf extract that barely has an effect on blood glucose levels. But what are lo han guo, sucralose, and erythritol? Let's take a closer look. Much as the stevia plant was used as a sweetener indigenously in South American countries for many years before it was popularized as an additive, lo han guo is a fruit native to China that has been used there as a natural sweetener (as well as a traditional treatment for diabetes and obesity) for thousands of years. It's also sometimes called the "monk fruit" or "Buddha fruit". Sucralose is table sugar that has been modified to remove calories and sugar's damaging effects on tooth enamel. It also does not affect insulin levels. Though you may not be familiar with the name, it's the ingredient used to sweeten Splenda. Erythritol is a sugar alcohol that's unique in that it doesn't cause the gastrointestinal distress that other sugar alcohols are known for. It has a minute number of calories (it's legally labeled as zero calories in the U.S., but actually has a fraction of a calorie per gram), does not spike blood sugar, and does not promote tooth decay. 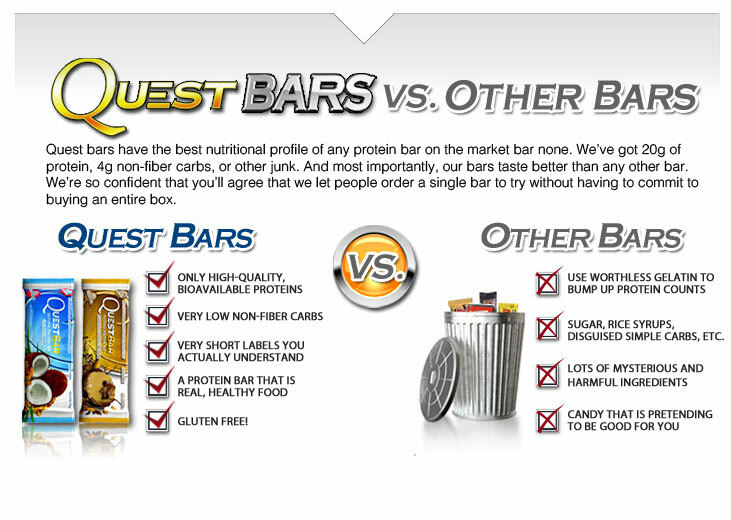 What makes Quest bars different than the competition's protein bars? Each of Quest Nutrition's protein bar flavors come from natural sources. For example, their chocolate bars use actual cocoa, and the berry bars use a combination of freeze-dried berries. The only major nutritional difference between the flavors is that some are much higher in saturated fat than others. The flavors with chocolate and cookies and cream are the heaviest, at about 3g of saturated fat per bar. Overall, most of the bars have very saturated fat, and several have none at all. Banana nut muffin, lemon cream pie, cinnamon roll, and, surprisingly, strawberry cheesecake are all completely free of saturated fat.